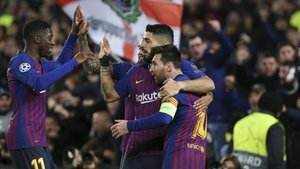 This week it's been revealed in a meeting between UEFA and the ECA (European Club Association) there has been talk about changing the format of the Champions League. The most surprising of which is moving the Champions League fixtures to the weekend from the 2024/25 season. The plan being proposed is that the best teams in Europe would play in a European Super League (16 teams) and those matches would take place on weekends, meaning league games would move to the current midweek slot. For this to happen the biggest teams would need to agree with the changes and right now, that isn't even a possibility. One of the sides who oppose this change the most is Barça. They believe that the current format of the Champions League has already proven to be successful and that the appeal of the European matches is enough to get supporters to attend midweek. It's also believed that LaLiga would suffer if more matches were moved away from the weekend, which would damage the domestic product. Barça don't want to hear talk of abandoning the league in order to focus on European tournaments. They believe that having two strong, separate competitions is better than just one. Not only due to financial implications but also the sporting side. Winning two important titles is certainly more appealing than just one. Barça are open to listening to ideas but have no intention of breaking away from the current structure of the modern game. Or, to put it more bluntly: Barça will never play a Champions League match at the weekend.